This is a stunning super silver necklace beautifully crafted in Persia. Beautifully made and great to wear. The silver has been cut in a gorgeous way as to create a really lovely sparkle, it is highly patterned in a filigree design, very delicate looking and feminine. 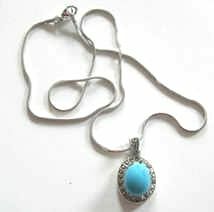 Necklace length with pendant is 9 ins. Turquoise is a healing stone for the spirit and the body. A protective stone that has been used for amulets since ancient times and was a favoured stone of the ancient Egyptians & Persians and still much prized in the Middle East. In Persia it is a symbol of wealth and is often given as a sign of friendship. A purification stone it protects against pollutants in the environment and balances the chakras and calms the nerves when speaking in public.